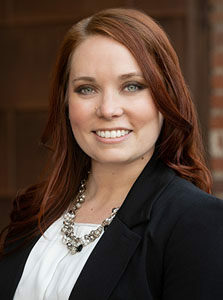 Denver Tax Attorney - Emily Procyk, Esq. Find out why you need a lawyer on your slide. Learn what you should know about the IRS and Tax Audits. Read and watch what our clients say about the experience working with our firm. Fill out our confidential, no obligation case evaluation form. Emily is originally from California and earned her Bachelor of Science in Biochemistry and Molecular Biology from the University of California, Davis. She then worked in the pharmaceutical industry before attending law school at the Vanderbilt University Law School. Emily’s employment history includes experience at a variety of different firms and organizations, including working under the Honorable Judge Don R. Ash. She practiced in criminal defense, family law, and general civil litigation. Emily was a member of the Moot Court Board at Vanderbilt Law School and received multiple scholastic excellence awards. 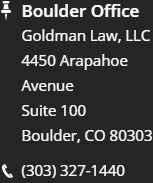 Emily also worked as a trial attorney at the Office of the Colorado State Public Defender where she defended the indigent accused in a variety of criminal charges. She gained extensive trial experience, representing her clients in both misdemeanors and felony trials. Emily is deeply committed to representing her clients in the most effective but compassionate way possible. She brings a client-centered approach to her practice and takes the time to truly understand her clients’ unique circumstances. 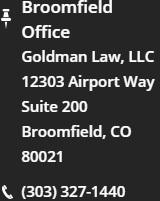 Copyright &COPY; 2019 by Goldman Law Firm. All Rights Reserved.